I spy a new Louisville food truck? Spotted on Main Street in Louisville. Looks like another food truck has jumped on the scene in Louisville. 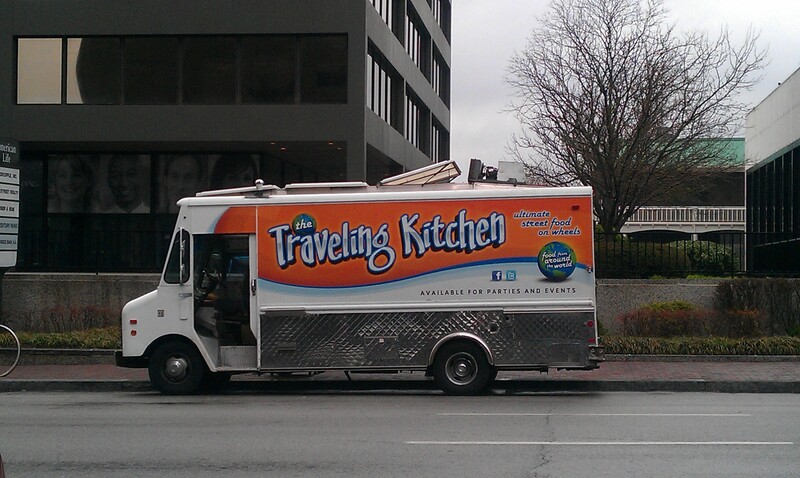 I spotted this beauty, The Traveling Kitchen, on Main Street near Third Street last week. I didn’t have time to stop and investigate (the day job beckons, my friends). Can anybody dish on this mobile eatery? Please share. The Traveling Kitchen is run by Pagua Victor (“Victor”) and can be contacted at travelingkitchen@yahoo.com. Two days a week, he is parked by the Humana Building. His menu consists of beef, pork and chicken tacos and he will be adding more items soon (burritos, bowls). The Traveling Kitchen will be participating in the next Food Truckus Ruckus on April 21, along with Lil Cheezers, Grind, Holy Moly, Holy Smokes, Moe-Licious BBQ, and Black Rock Grille. Hi Alice, do you have a bit more information on the Food Truck Ruckus. That you can share with us? I hate that we missed it last year and would love to come this year! Nice article Ashlee! Found my answer after doing a little searching! https://www.facebook.com/events/312913485431811/ Third Annual Food Truck Ruckus!